Do not let my jaded perspective ruin your desire to find a great league. I am always looking for a great group of gamers that want to have a genuinely great time playing the game for the sake of fun and community. There are a few of these almost mythological leagues and dynasties out there. The hard part is finding one that will accept a new member or finding one that is even looking for new members. If you are looking for an online league for any sports game you would be wise to check out the forums over at OperationSports.com and TraditionSportsOnline.com. I would be remissed and it would be unfair to tell you that every league and online experience is terrible. However, this article is meant to educate you of the downfalls because if you find something great there will be no reason for you to read the rest of this article. However, if you are looking for honesty with objective, personal experiences and opinions – NoobTubeTV.com is always the best place to find it. 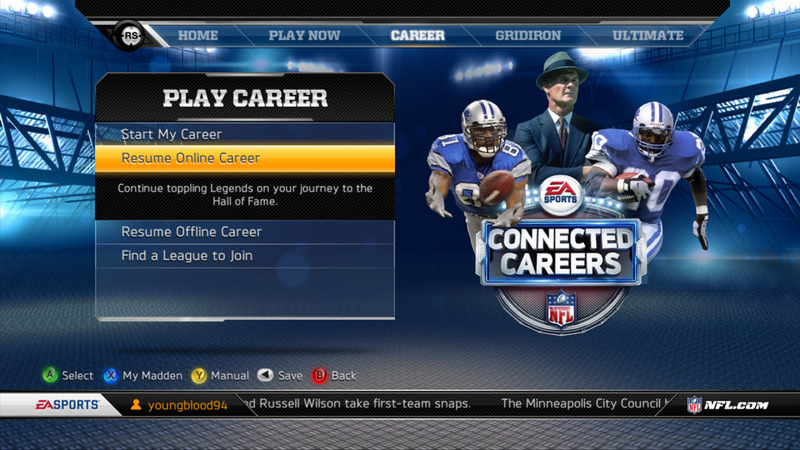 Online Connected Careers could be Madden’s saving grace. There is a fine line between friendly competition and taking a game a bit too seriously. In my early gaming years it was hard for me to take a loss… even to the CPU. Somehow the ‘Reset’ button would always get hit or I would have something come up that I had to do that would make me turn the game off. What I started to learn after awhile was that it gave my season quite a bit more enjoyment to lose a game that I either didn’t play well or was simply outclassed by better opposition. Something happens when you start playing other people in sports games though. It is as if the stress level increases exponentially and your enjoyment of the game gives way to one thing – winning at all costs. The issue is starting to climb more and more as online competition becomes more ubiquitous with gaming in general. There are two primary reasons why online sports gaming is avoided like the plague by a large percentage of sports gamers. If you have played a game of Madden NFL online, the chances are good that you have come across someone that either becomes verbally abusive if you start winning or they do something that is almost more annoying. Cheating or Cheesing (using shortcomings of the game’s AI or a certain play that is almost unstoppable every time) has given gamers a reason to avoid online sports gaming altogether. In these cases, it really just ruins the game for people that either aren’t experienced or prefer to play a more ‘simulation’ style of game (look for our upcoming article on ‘Simple Ways To Be A ‘Sim’ Gamer’). Over the last few years many sports games have started allowing online leagues to form so that groups of gamers could find purpose in what had been up until that point trivial leaderboard competitions at best. There had been communities of gamers making their own online leagues for years. It wasn’t until EA Sports gave gamers a chance to run a league with NCAA Football 09 that it became a bit more ‘mainstream’. 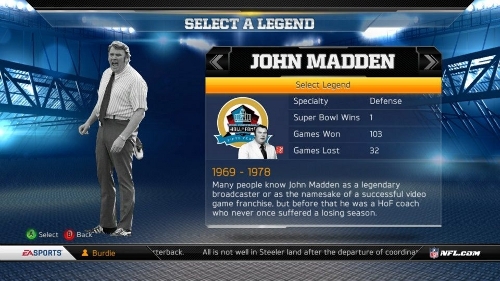 In Madden 10, it finally came in the form of the sickeningly bare-bones ‘Online Franchise’ mode. In order to get Madden you should probably pre-order the game from GameStop. Personally, I miss his presence in the game that has made his name even more immortal. Now that all gamers had a chance to join a league in NCAA or Madden Football it was only a matter of time before the friendly leagues with a lot of promise turned into glorified Lobby Matches. In college football leagues all you need to do is lose a game to effectively end your chances to win a championship and then you start seeing league member quit by the week. In the pro game, it is a bit more forgiving if you lose a game… or five. The problem with Madden is that for some reason a lot of the people that play it competitively make it seem like it is a requirement to be rude or make every game into some sort of digital war of ‘money plays’. Sure, there are occasions when you will find a decent game but those seem to be as fleeting as the leagues they are a part of. It isn’t a question of whether or not online leagues are a good idea or if there are ‘good’ leagues out there. For most people, it just isn’t as much fun to play in an online league because they have to wait for other people. On a personal level, it isn’t uncommon for me to play two or three games at a time during my sports gaming sessions. If you are in a league with multiple users you usually have to wait on a scheduled advance before you can play another game. I don’t want to plan my week or my days around other gamers. If I start a game and in the middle of the first quarter I need to leave for an emergency I don’t want to have to explain myself to anyone, let alone some guy in my league. If it is a friend, of course they will understand but when you start getting into leagues and ‘official sites’ it can turn into some sort of elitist club of ‘Uncle Ricos’.